Presenting his first Budget as Karnataka Chief Minister, HD Kumaraswamy waived all defaulted farm loans till 31 December 2017 and raised the prices of petrol and diesel. In his budget speech delivered in the Karnataka Assembly on Thursday, the Janata Dal (Secular) leader said the waiver of farm loans would give Rs 34,000 crore benefit to the farmers. “To facilitate the farmers to avail new loans, action will be taken by the government to issue clearance certificate by waiving the arrears form the defaulting account. For this purpose, Rs 6500 crore is earmarked in 2018-19 budget,” said the Karnataka CM while presenting a budget that was clearly farmer-centric. “I propose to waive farm loans up to Rs 34,000 crore, with Rs 2 lakh per farmer family,” Kumaraswamy said while presenting the state budget. He said that all defaulted crop loans of farmers up to 31 December 2017 will be waived off in the first stage. The CM also said that those who have repaid the loan within time will be credited with the loan amount or Rs 25000, whichever is less. 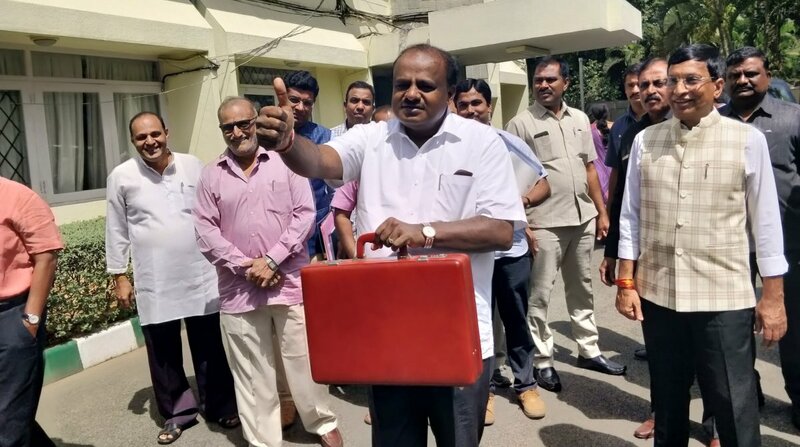 Presenting a Rs 2,13,734 crore budget, Kumaraswamy proposed to increase the rate of tax on petrol from the present 30 percent to 32 per cent and diesel from 19 per cent to 21 per cent. The rise in taxes will increase the cost of petrol and diesel in Karnataka by Rs 1.14 per litre and Rs 1.12 per litre, respectively. People in Karnataka will also have to pay more for the power they consume as the Chief Minister proposed to increase power tariff by 20 paise per unit. “I also propose to increase excise duty on Indian made foreign liquor by 4 per cent to raise additional revenue for meeting the budget expenditure,” said Kumaraswamy. In his budget speech, Kumaraswamy announced the formation of Karnataka State Farmers Advisory Committee consisting of “progressive” farmers who will work towards the welfare of the farmers in the state. A grant of Rs 150 crore to introduce Israeli system of dryland irrigation in Kolar, Chitradurga, Koppal and Gadag was allocated. Another Rs 50 crore was earmarked for Zero Capital Natural Farming project based on the Andhra Pradesh model. Kumaraswmay’s government also allocated a grant of Rs 5 crore to encourage start-ups for complementing new innovations in agriculture. A Silk cocoon market will be set up in Mysuru district for Rs 3 crore and Rs 2 crore will be spent for the creation of marketing opportunities for silk by-products. Kumaraswamy, an elected MLA from Channapatna in Ramanagara district in southern Karnataka, allocated Rs 5 crore for rejuvenation of KSIC Karnataka Silk in his constituency. Kumaraswamy, who heads a coalition government of JD(S) and Congress in the state, also praised the former Congress government’s flagship programmes assuring that they will be continued. “Considering the popularity of Indira Canteens in Bengaluru, action has been taken to open 247 Indira Canteens in all taluks and district head quarters of the state at an expenditure of Rs 211 crores,” he said.